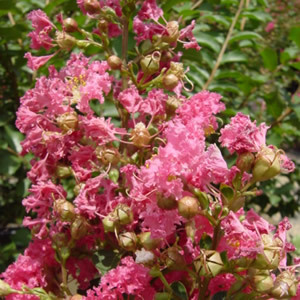 The Tuscorora Crapemyrtle was introduced in 1981 by the National Arboretum and is a fast growing tree with a mottled, light brown trunk. Its leaves are first red tinged when immature then mature to a dark green color and in the fall they will turn a orange-red color. Its flowers are a coral-pink color that last July through late September or roughly 70-80 days. Grows to be 25 feet tall and is less susceptible to powdery mildew as well as leaf spot.